The US is once again attempting to justify another deadly blunder in which dozens of innocent people were murdered in the name of the war on terror. From their teleprompter fed pulpits, detached bureaucrats discuss this war in terms of numbers only. The notion of humanity is completely absent from any and all decisions made by the state in their quest for empire. The murder of innocent children is renamed collateral damage. Real terrorism, in which entire countries are kept in a constant state of fear of bombs raining down from the sky fired by US drones is renamed asymmetrical warfare. The photos of dead children, blown to bits by hellfire missiles fired from US predator drones aren’t allowed on television. The grim reality of the warfare state is but a blip on American media. Meanwhile, the rest of the world is watching as history’s largest empire is violently expanding its special interest owned tentacles into countries across the globe. In America’s latest attempt to “protect the citizens of the US,” an aerial bombing in the Afghan city of Kunduz was conducted. The target? A hospital. 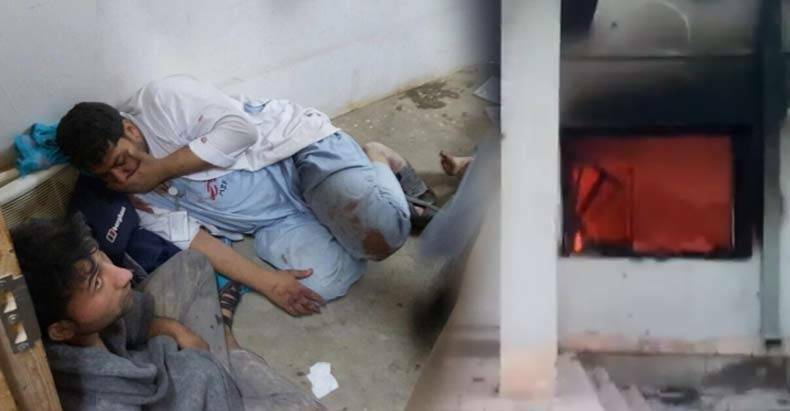 An MSF source told the Guardian that up to 20 Afghan members of staff and patients were killed and dozens more injured. They said the death toll could rise further. Among the killed were nine MSF staff and seven patients from the intensive care unit, including three children. To keep you safe from “terrorists” the US blew up a hospital and killed people who’ve selflessly devoted their lives to helping others. This is what spreading democracy looks like. What Tribus means when he says “under investigation” is that the story will be swept under the rug so we do not wake the American people up to our murderous actions. According to the MSF, their GPS coordinates of the hospital were widely broadcast to all parties fighting in the conflict. Despite this warning, the bombing continued. Bombing continued for >30 minutes after American & Afghan military officials in Kabul & Washington first informed of proximity to hospital. What is in my heart since this morning is that this is completely unacceptable. How can this happen? What is the benefit of this? Destroying a hospital and so many lives, for nothing. I cannot find words for this,” MSF nurse Lajos Zoltan Jecs said of the atrocity. Please share this article with your friends and family who may not know about these brutal acts of violence that are being conducted in their name.